Complete with a gingerbread recipe and patterns printed on the inside cover of the book, this children’s picture book is a tool to teach children how to make gingerbread houses in the classroom or in the home. Additional resources, including tips and ideas on how to make a gingerbread house, free recipes, a photo gallery and free printables are all available on the Gingerbread from the Heart website. A complimentary lesson plan and 3D gingerbread template are provided when ordering the book. Gingerbread from the Heart is a heartwarming story about young children who cannot make Christmas cookies with grandma, because grandma is down with a bad knee. While reminiscing about past Christmases and spending quality time with grandma, the children decide to make gingerbread houses to lift her spirits. In the process of making and decorating the gingerbread houses, a sense of competition arises within the main character, Kristin, as she earnestly anticipates which gingerbread house grandma will like the best. 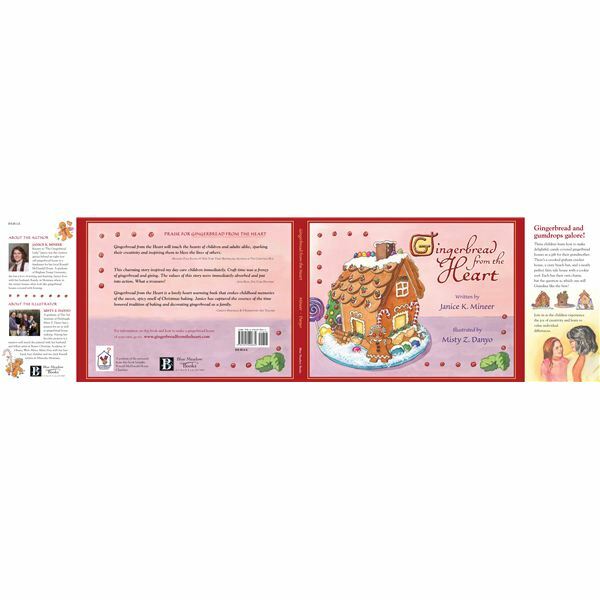 Gingerbread from the Heart is a beautifully written and illustrated children’s picture book about the harmony of making and decorating gingerbread houses together and the value of each individual’s talent when they give from the heart. Mineer skillfully crafts the written word with imagery, descriptive words and well planned figurative language to engage the attention of young readers in short sentences and paragraphs throughout the story. A must read in any classroom and home during the Christmas holidays, teachers can use this book across the curriculum in social studies, language arts, math, science and art. Well known among her friends and colleagues as “The Gingerbread Lady,” Janice K. Mineer combines her expertise in gingerbread making with a proficiency in writing. She received a formal education from the Brigham Young University. Giving from the heart is evident in Mineer’s life as she generously gives a portion of the proceeds from the book, as well as holds charitable events in gingerbread making for the Ronald McDonald House of Missoula. The snow quietly settling on the rooftops in Montana where she resides inspires her gingerbread creations and is depicted through the words and illustrations of this story. This children’s literature book is entertaining for kids and adults alike. The story is presented sequentially in the same order that a gingerbread house is made. This makes the story a realistic teaching tool that can be used on many levels across several subject areas as indicated above. Mineer’s understanding of the process of gingerbread making is represented realistically throughout the text. Kristin thought, “Her fingers soon smelled as sweet as the candies themselves.” During the process of making gingerbread houses your fingers truly smell like candy! When he [Brandon] got done spreading it around in front of his beach hut, it looked like there had been a hurricane! Making gingerbread houses with kids is fun and messy! She [Kristin] imagined a crispy cookie for the door on her gingerbread house and a tiny cinnamon candy for a knob. And what for snow in the yard? Flakey coconut! Making a gingerbread house inspires creativity and imagination! As seen through these examples, Mineer uses imagery, descriptive words and figurative language. These writing techniques are supported by the three dimensional illustrations of the setting and characters. Also, each illustration on the corner of each page is carefully chosen to complement the storyline, which will serve to help young reader’s visual the text. We can glean a great deal about the characters by their portrayals and depictions in the text and the three dimensional drawings, respectively. She [Kristin] lined up gumdrops across the top of the house — red, green, yellow, purple — all in a straight row. She concentrated so hard, her eyes nearly crossed! …Maggie was more interested in licking the frosting off her fingers. This is a story about giving from the heart. When a person gives from the heart, the true reward is the gift of happiness. It is the perfect gift every time. The story exemplifies that the true concept of gift-giving is to give joy, happiness and love. The other lesson being, it is not whether a finished gingerbread house is right or wrong, good or bad. This cannot be judged, because the end result is a reflection of the heart of the person who made it. The feelings Kristin experiences are relevant and significant to children and adults alike. Mineer demonstrates the competitive nature of children. Students will likely identify with Kristin’s feelings either at school or at home. Kristin resolves the internal conflict when she realizes that her work was indeed recognized on its own merit and that each person is valued for his or her differences. She realizes that she shares the reward of making grandma happy with her siblings. As Christmas is a time of good will, children will learn a valuable lesson about gift-giving through Gingerbread from the Heart. They will also learn the value of their own individuality and uniqueness. Even if a child has never baked gingerbread before, he or she will understand the meaning, the process, and the messy fun of making gingerbread house memories. A truly inspiring story for the old and young alike, I look forward to sharing this story for many, many years to come. This book is available to preview online, so enjoy!